Local women are not amused (apart from Nanny Ogg, obvs). The UK is under new leadership this morning following a coup by the Patrician of Ankh-Morpork, Lord Havelock Vetinari. 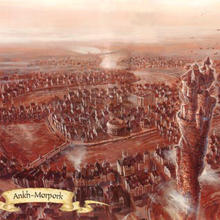 Ankh-Morpork: a sprawling city-state ruled by a tyrant where life is often nasty, brutish and short. Beats the crap out of London. Britain has been plunged into an emigration crisis as newly published figures reveal that no fewer than seven out of ten of us have applied to leave the country to live and work in Ankh-Morpork.